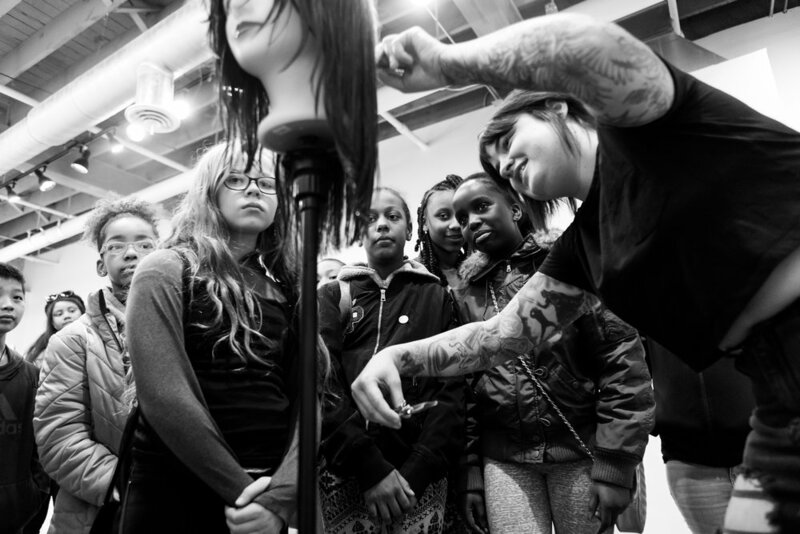 Kindness as a catalyst - how one haircut inspired Katie Steller’s mission to bring us together. You know those days when you feel like the world is just heavy? That you can’t deal with another bad news story, and you begin to wonder how it will ever get better? On those days, it can feel that we are cogs in a machine that we have no power to change. So, many don’t try. Yet, some make a small step to change something that matters to them, and they set in motion something far more significant than themselves. From the outside looking in, Katie Steller is a successful hair salon owner. Look closer, and you’ll see that she’s using her talents (along with business savvy and a large dose of courage) to help the world be a more positive and caring place. For most us, making the occasional donation at Goodwill can feel like a triumph. (“The bags are no longer in my trunk! Yesss!). We wanted to know: what does changing things really take? How does it feel? What choices do we need to make? How do we know that it matters? We talked with Katie to get a sense of how she’s reached this point in her journey. Let’s start at the beginning - how did Steller Hair Company begin? I never wanted to be a hairstylist because of the hair. My life was impacted immensely by a "simple" haircut. As someone whose body was taken over by autoimmune disease from a young age, I was often talked about as if my illness defined my humanity. I was never just "Katie." When I sat down in Amy White's stylist chair, I felt like more than an illness. I felt like a person. The hair industry can come across as superficial - that can sometimes be true. I started Steller Hair to be the change I wanted to see. Instead of complaining about the aspects that weren't ideal, I wanted to do something different, even if it wasn't perfect. I decided to run my salon with the mindset of "what can I do for you" instead of "what can you do for me." If my team felt safe, valued and supported, the natural assumption is that our clients would feel that vibe as well! After several years of growing Steller Hair Co, you started the Steller Kindness Project - what inspired it? Steller Kindness is a platform to share stories of kindness and light in a pain-filled world. Stories of hope and connection, when so much of life threatens to tear lives and communities apart. The project was a product of my despair with what was happening in the world. The news was filled with mass shootings, natural disasters, public hate, and discrimination perpetuated by people in power towards humans. Also, I had just experienced the worst few years of my life. I had been in and out of treatment for my mental health while building a business, as well as going through a public divorce with my then business partner/husband. I reached a point of "there is too much pain, and I can't do anything about it." I recognized my soul giving in to the belief that nothing I do could ever make an impact on the trauma of what was happening in the world. In that moment of hopelessness, I had a thought: There is so much pain, sadness, hate, and terror happening in the world, it feels like that is all there is - but is it? What if I made it my "side-project-mission" to start seeking out the good, and start sharing stories of people who are showing up with quiet acts of kindness. "Hate" is often so loud, what if we started giving kindness just as much attention? Steller Kindness Project began with a simple Instagram post asking people to "tell me a story." I wanted to hear about a moment that someone felt cared for by someone else. This person could be a family member, a friend, a total stranger, anyone. My inbox started to fill up, and the stories I received were remarkable. It wasn't the "deed" that was amazing; it was the impact. The fact that someone was so impacted by another person to share the experience with a total stranger was powerful. It was at this moment that I realized there was an opportunity. My goal was not to distract from the pain in the world, because that deserves every bit of respect and attention it demands. My goal was to have a both/and approach. Good can exist alongside evil, and pain can live alongside healing. You confidently "put yourself out there” - with your business, new ideas, and your writing. We know it’s not as easy as it looks. What hesitations have you had to overcome? Oh man, to be honest, "confidently putting myself out there" is quickly followed by "did I post that? I mean, yes I believe in what I said, but maybe it was too much? What if someone misinterprets it? What if I just made a total fool of myself?" When I feel this way, I try to remind myself that everyone is "in the same boat." We are all living life for the first time, and we are all making choices based on personal experiences and surroundings. This reminder helps me pause when I face the fear of what others think and it makes me revisit my "why." In my experience, understanding why you do/believe/stand for something is non-negotiable — figuring out the how or what can happen as you go. What advice would you give to women who are trying to find or rediscover their voice? If you have something to say, say it with confidence and give others the chance to respond. This doesn't mean you are an expert, or you are free from being wrong. If you choose not to speak your truth, you are robbing others of the chance to learn and be inspired, but also minimizing the reality that you are a valuable asset to humanity and your experience is unique. Loneliness can be a common challenge for entrepreneurs - is it something you experience? When I started my journey as an "entrepreneur," I had a partner in life and business. I never thought I'd be doing this alone, and I also didn't expect my business to grow at the rate that it did. The loneliness is real, and something that you can’t hope others will see without you sharing it with them. Take my business for example. I own a hair salon, and have a team of 18 amazing individuals. We have hundreds of clients through our doors every week! I am continually connecting, and I love it. However, I am also lonely. Part of that loneliness comes from the responsibility of being a leader and business owner. The other part of loneliness is on a more personal aspect. It's hard to find non-work related people to connect with who "get it." What trade-offs have you made to get to this point? I have just turned 29. I had been feeling the weight of this one, not because of getting old, but because I realize I "missed out" on a fair amount of my 20s. When I have told others this realization, they'll say: "but you've done so much!". There is truth there; I have accomplished a lot. The trade-off? I have been in survival mode, which means the years have gone by fast, and I have been present for very little. I'm honestly not sure what I could have done differently, and still have the results of where I am today. I do not regret it - I did the best I could in every situation. However, there has been loss and sadness that has simultaneously existed with the validation and success of where I am today. What advice do you have for other women who are in a similar position? Stay connected. You will sometimes have every reason to disconnect from your people, due to stress, lack of time or feeling overwhelmed. Those are all valid reasons. But - do your best to stay connected. You are not an island, and you are most definitely not alone. Your latest project is "Steller Connect" - what’s your vision for it? Steller Connect is a transformative space for brilliant ideas. Similar to the mindset of Steller Kindness, I realized that maybe the changes/inspirations I want to see in the world don’t need to come from me - what if I use my platform to support the stories/ideas of others? Have a few more minutes? 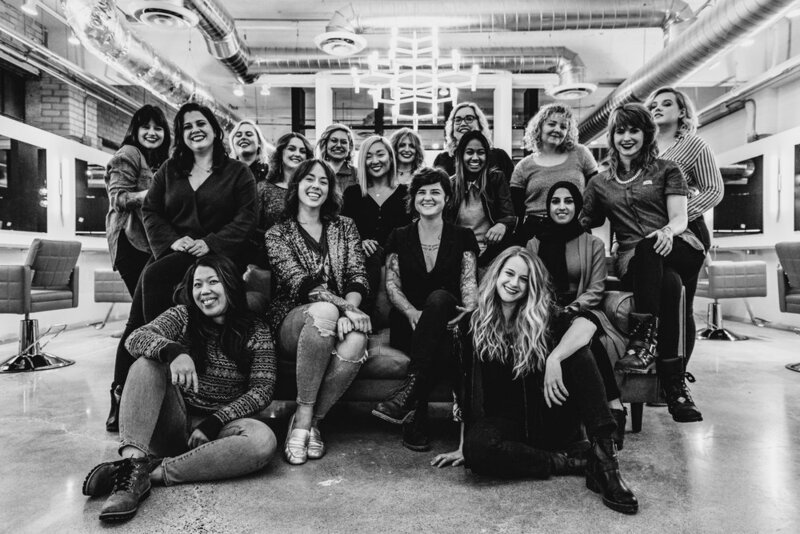 Check out more on Steller Hair Salon, Steller Kindness Project, and Steller Connect.